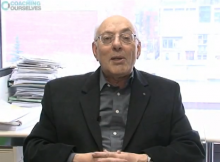 In this video, professor Henry Mintzberg introduces the CoachingOurselves approach, co-developed with Phil LeNir. First developed in 2003 as a tool for Phil and his management team, Henry and Phil co-founded CoachingOurselves in 2007 to bring Henry's approach to management and leadership development directly into organizations. Watch Henry Mintzberg introduce CoachingOurselves. Management expert Henry Mintzberg has played a major role shaping the world's concept of managing. This video is an extensive and popular introduction to this world-renown management thinker. Henry Mintzberg co-founded CoachingOurselves with Phil LeNir in 2007. Watch the introduction to Henry Mintzberg. Phil LeNir and Henry Mintzberg first developed the idea of taking Henry's approach to learning and development directly into the organization in 2003. In these interviews, Henry Mintzberg and Phil LeNir describe the background and share their views on the CoachingOurselves approach to leadership development. Watch the Mintzberg and LeNir Interview with Sculley on the world show. Watch the LeNir interview on VentureCap TV. Henry Mintzberg has published numerous books on a broad range of subjects. Of particular interest to those also interested in his CoachingOurselves approach is his original book on Management, The Nature of Managerial Work, Managers Not MBAs, and his newer books on Managing. The Nature of Managerial Work on Amazon. Managers not MBAs on Amazon. Henry Mintzberg has published dozens of articles. Following are some of the articles directly related to CoachingOurselves. Unfortunately, some must be purchased, such as the article on rebuilding companies as communities. Henry Mintzberg and Jonathan Gosling developed the concept of the five "mindsets" basic to the practice of management. They are (1) Reflection, about managing self; (2) Collaboration, about managing relationships; (3) Analysis, about managing organizations; (4) Worldliness, about managing context; and (5) Action, about managing change. The IMPM program and other programs by Henry use the mindsets. CoachingOurselves is used to create programs based on these Mindsets. 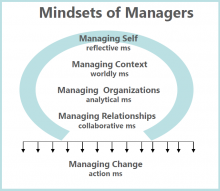 And the five Mindsets are described in great details in Henry's book, Managers not MBAs. 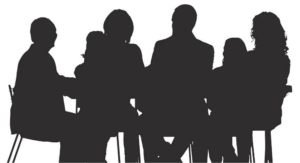 Published in HR Magazine, in this article, Henry Mintzberg and Jonathan Gosling describe the practice of reflection and its role in the development of experienced managers in the IMPM program. CoachingOurselves is based on this reflective practice and group dialogue. Henry's website is full of free articles and readings by Henry, links to all his books and management programs, his resume, his TWOG and much more. Henry Mintzberg talks about reanimating the relentless curiosity for learning. Henry Mintzberg discusses the rebalancing of society through the collaboration of the private, public and plural sectors.